Before television there was radio. And before that there was Charles Dickens and his timeless seasonal classic, A Christmas Carol. In this performance, we recreate the age of radio with a stage presentation of Dickens' story. 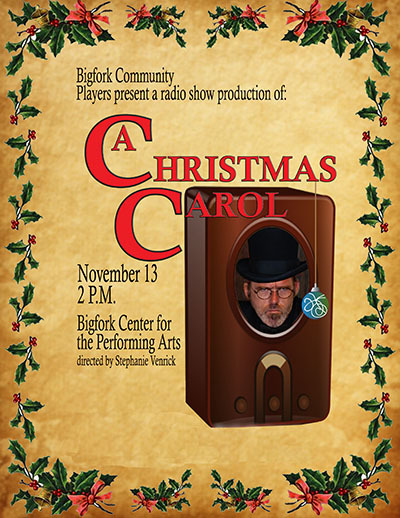 Taken with minor modification from the original radio play produced by The Campbell Soup Company, this production tells the story of a very special Christmas Eve experienced by one Ebenezer Scrooge. Using only stage microphones and a Foley table for sound effects, the cast of this production present an auditory experience, much like what would have been expeienced in the live radio studio many years ago. With a live cast recreating the roles played by Orson Wells and Lionel Barrymore, among others, this is as close to an early 20th century production as you will find. Sunday, December 25, 6:00 a.m. & 2:00 p.m.
Broadcasting from Kalispell at 600 KHz on the AM band. On the Web at www.KGEZ.com.